This weekend, Honda returned to Goodwood Festival of Speed celebrating 25 years of its pioneering sports brands, Type R and Fireblade. 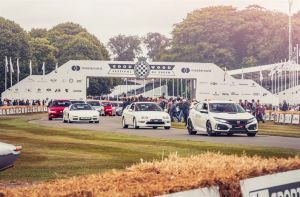 In addition, the world’s most advanced Hydrogen vehicle, Honda’s Clarity Fuel Cell, made its UK debut on the Goodwood hill climb. Honda’s historic display of Type R vehicles included the original 1992 NSX Type R, Integra Type R, Accord Type R and all Civic Type R models. The impressive line-up is completed with the UK debut of the much anticipated 2017 Civic Type R - the current FWD lap record holder around the Nurburgring Nordscheliefe. All Type R models participated in an exclusive 25 years of Type R hill climb, led by British Touring Car Champion and Honda Yuasa driver, Matt Neal. The Goodwood hill climb consists of 9 turns and ascends 1.86km through the Goodwood Estate in Sussex, UK. Both Type R and Fireblade signify Honda's racing heritage and history as a motorsport inspired vehicle manufacturer. The Honda stand brought to life the culture of discovery, exploration and challenge, enriched within the Honda brand. Visitors were able to immerse themselves in a collection of Honda products via interactive challenges. The Goodwood Festival of Speed took place from Thursday 29th June until Sunday 2nd July.